I don’t really need to use clamps when gluing up a dulcimer peghead assembly but I feel better knowing the clamp is there. Hide glue added to a clean and well-fitting joint grabs and pulls the joint together as the hide glue sets up. 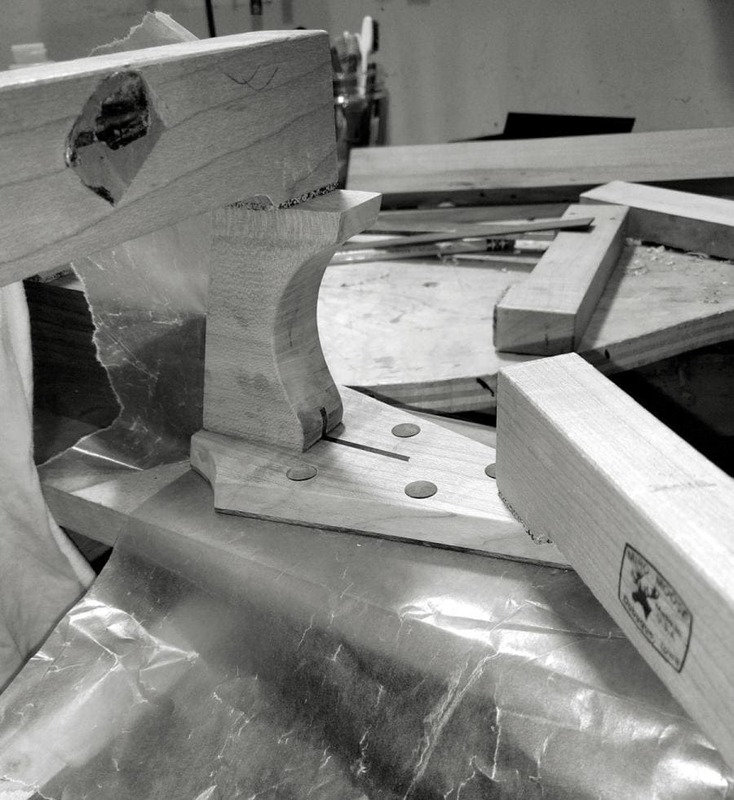 Clamping the parts together at an angle is tricky but in the photograph you can sort of see the peghead and the block beneath it are pressed up against an angled block of wood covered with wax paper. The peghead is clamped to the work board and there is wax paper on the work board as well. This arrangement keeps parts from sliding when downward pressure is applied to the joint. They probably wouldn’t slide anyway since I’m using hide glue but I feel better knowing there is no chance of a rude surprise. The wax paper prevents someone from getting a dulcimer with a work-board and an angled block of wood stuck to the peghead. That would make the dulcimer difficult to tune and it would be hard to find a case that fits. After everything is clamped up I clean up the squeezed out glue with a rag and warm water. This is another benefit of hide glue; it cleans up with warm water and a rag. You can see more photographs of dulcimers in progress and other stuff by following me on Instagram. You are free from what you have understood.